It has been my intention to share this "new" method for cooking baby potatoes since last fall. So easy—anyone can do it...and so delicious—producing potatoes with tender, moist, and creamy interiors and skin that is tender in some spots, browned and lightly crisped in others....they have become a part of my regular repertoire. Once you try them, I predict they'll become a part of yours too. I first sampled these potatoes while visiting my friend Bonnie. They are prepared with a simple étuvée—a gentle heat, stove-top cooking procedure that uses a minimum of liquid and a small amount of fat. 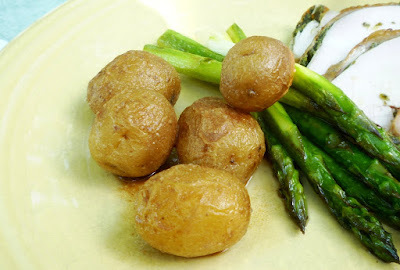 I have posted several recipes that use this procedure for a variety of different vegetables (celery root, leeks, asparagus and broccoli)....and I use it regularly...but for some reason I had never applied it to whole, unpeeled baby potatoes. And I guess I have to say that I have been missing out. To prepare the potatoes: Rinse them well to remove surface dirt. Place the potatoes, along with the water from their wash still clinging to them, into a deep sided sauté pan...or a small sauce pan...that is just large enough to hold the potatoes in a snug—but not tight—single layer. The pan should have a tight fitting lid. Add some olive oil...and butter, if you like...to the pan. Use just enough so that the fat will film the bottom of the pan once the butter has melted. Salt the potatoes (in a quantity similar to what you would use if you were going to roast them) with kosher salt. Place the pan over moderate heat and let the butter melt. Slide the pan back and forth over the heat so that the potatoes will roll around and coat themselves in the fat. Cover and cook until the potatoes begin to sizzle...this will only take a minute or two. Reduce the heat to very low and cook (covered), shaking the pan now and then, until the potatoes are tender to the tip of a knife and have begun to turn golden in spots. Depending on the size of the potato, this will take 20 to 40 minutes. The potatoes should not aggressively pop and sputter as they cook...rather, they should give off an almost imperceptible sizzle...this is a gentle procedure. When the potatoes are done, there shouldn't be any water left in the pan. If there is, let them cook uncovered for a minute or two to allow the water to evaporate. Give the pan another back and forth slide or two to give the potatoes a final baste. Then, transfer them to a serving bowl...or individual plates...and serve. Drizzle any fat remaining in the pan over the potatoes. 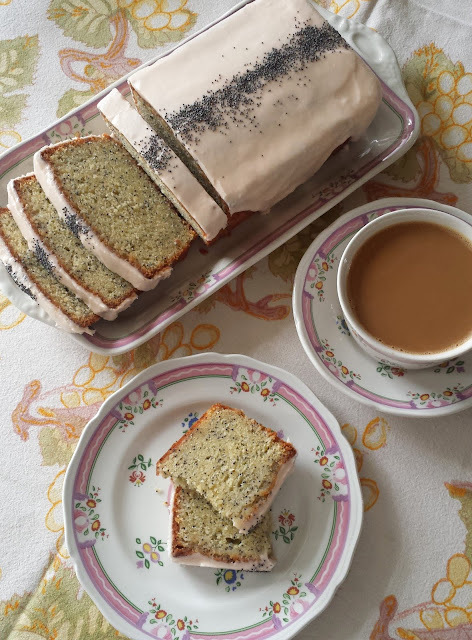 I should note that when Bonnie prepared these, she used all olive oil. They were delicious this way. When I make them, I always add some butter because the butter browns a bit as the potatoes cook...and I love the taste of browned butter. If you use butter, you will need to uncover the potatoes once or twice while they are cooking to make sure the butter isn't burning. If the butter is threatening to burn, add a tiny splash of water to the pan. I love the simplicity of these potatoes, but I'm sure they would be delicious with any number of additions. You could add some whole, peeled cloves of garlic....sliced garlic...sliced or diced shallots...several sprigs of thyme, rosemary or sage. You could probably cook potatoes this way in bacon fat too. Simply render some bacon in the pan the potatoes will be cooked in. Remove it to a plate when crisp, add the potatoes to the rendered bacon fat and cook as with olive oil or butter. Serve with the crisped bacon crumbled over. Some minced fresh herbs (parsley...chives...dill) would make a nice finishing touch too (with or without the bacon...). Another thing I love about these potatoes is that they are easy to incorporate into any meal...big or small...that I might be preparing. They take up only one burner...no oven space...and they hold well for service. To hold them after they are finished cooking, simply set them aside in a warm spot with the lid ajar. They will stay hot for some time while you finish the rest of the meal. All of this is especially nice if you are feeding a crowd and other things (people...other parts of the meal...) are vying for your attention. At the table, I like to crush the potatoes with my fork, mixing the salty skins in with the creamy interior. It isn't necessary to embellish them further...but a pat of butter ...or drizzle of olive oil...or dollop of herbed sour cream....would probably be pretty nice. If your entrée happens to come with drippings (from a roast chicken...or pan-seared chop).....or a sauce (salsa verde....aioli....)....these potatoes make a pretty efficient way to swab up every last drop. They are the perfect potato for everyday.